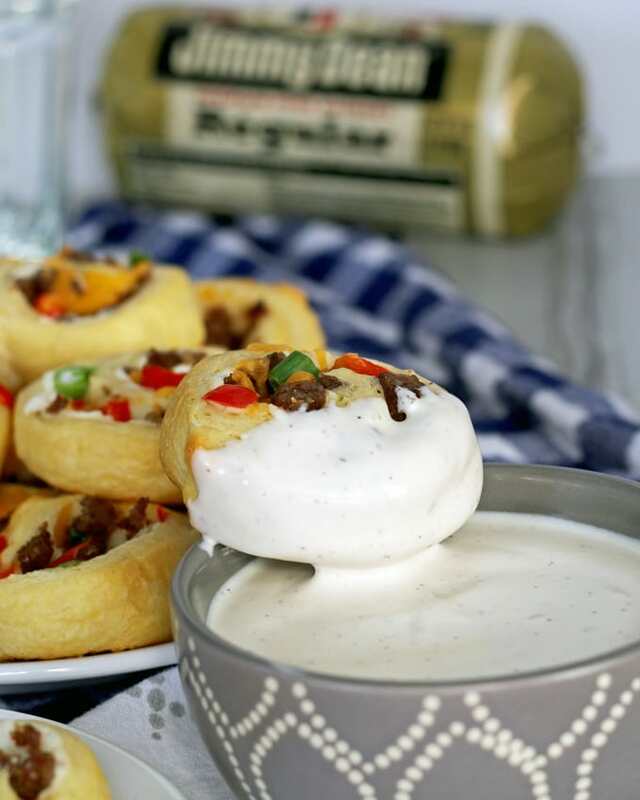 If you’re looking for game day food, this sausage pinwheel appetizer is going to be your new favorite recipe for tailgating season. 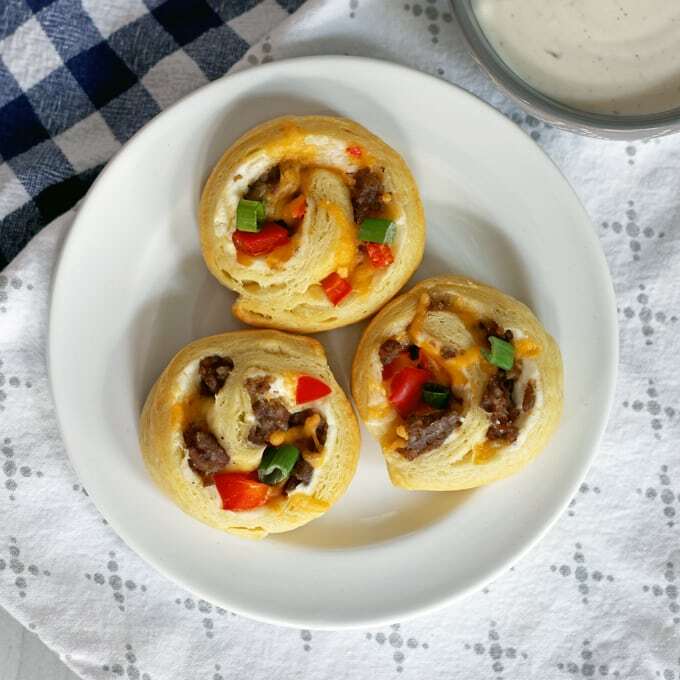 It’s made with sausage, refrigerated crescent rolls, red bell peppers and two types of cheese; it’s an easy and delicious appetizer to add to your party. Just serve it with a little ranch! The big game is almost here and I have tailgating on my mind!! I like to refer to late January/early February as “Finger Food Season” because I start making appetizer recipes every day as we count down to the big football season finale. I have a few go-to game day recipes and foods I like to serve when I have people over to watch football. Buffalo wings, taco dip and a handful of finger foods fill our dining table and people will snack through out the whole day. There is no better feeling than your guests heading home after their team wins with full bellies. 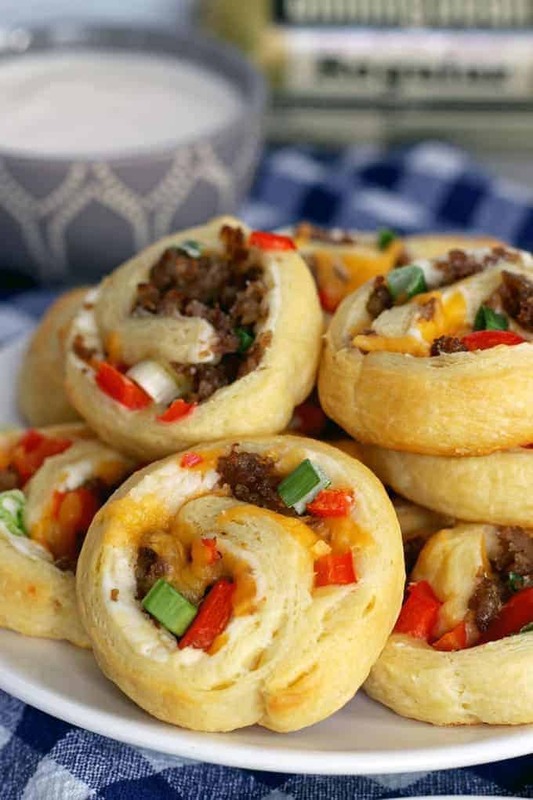 The newest addition to my appetizer arsenal are these sausage pinwheel appetizers. 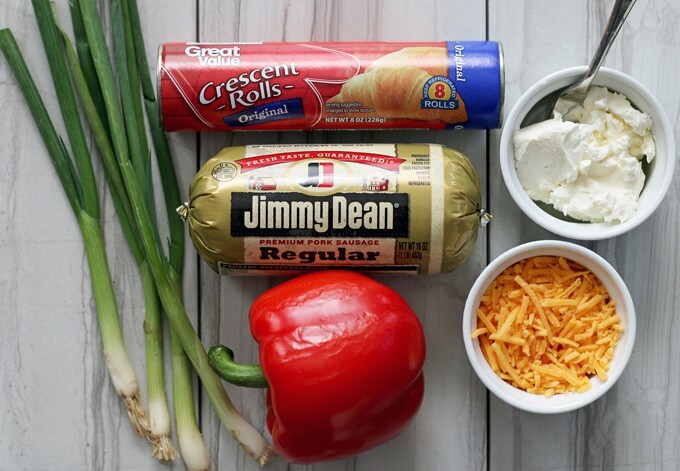 They’re made with Jimmy Dean sausage, refrigerated crescent rolls, red bell peppers, green onions and two types of cheese – cheddar and cream cheese. You are just going to love how easy these are to make! You can find Jimmy Dean sausage in the refrigerated section of your local Walmart. While you’re there, grab a few of the Great Value items to help you create a delicious game time party. Walmart offers many convenient, simple items so you can spend more time with your family and friends! To make these easy appetizers, first cook the sausage in a large pan on the stovetop. While the sausage is cooking, roll out your crescent roll dough on a cutting board, being careful to keep the perforations in tact. Use your fingers to pinch all of the perforations closed so that instead of many crescents, you have one big sheet of dough. For ease of rolling, I then like to cut the dough in half, but this step is not necessary. Turn the dough so that it is horizontal and apply the cream cheese in a thin layer, leaving an inch of dough un-creamed. 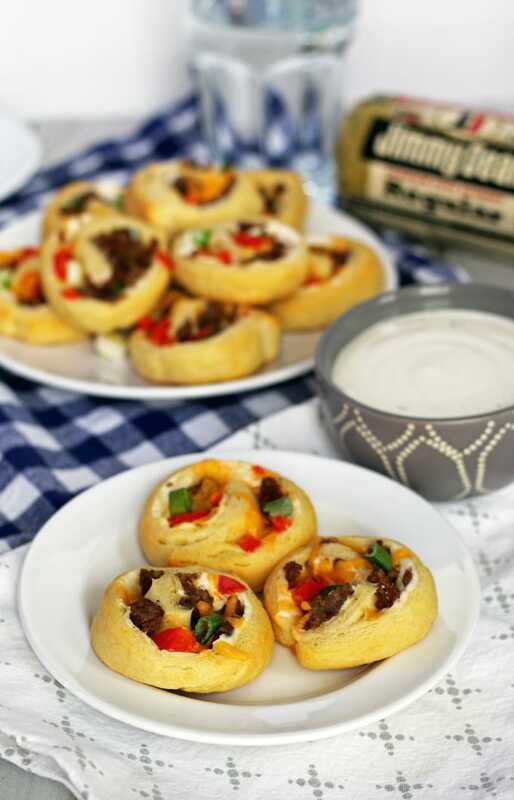 Top the cream cheese with an even sprinkling of the cooked sausage, red bell pepper, green onion and cheese. 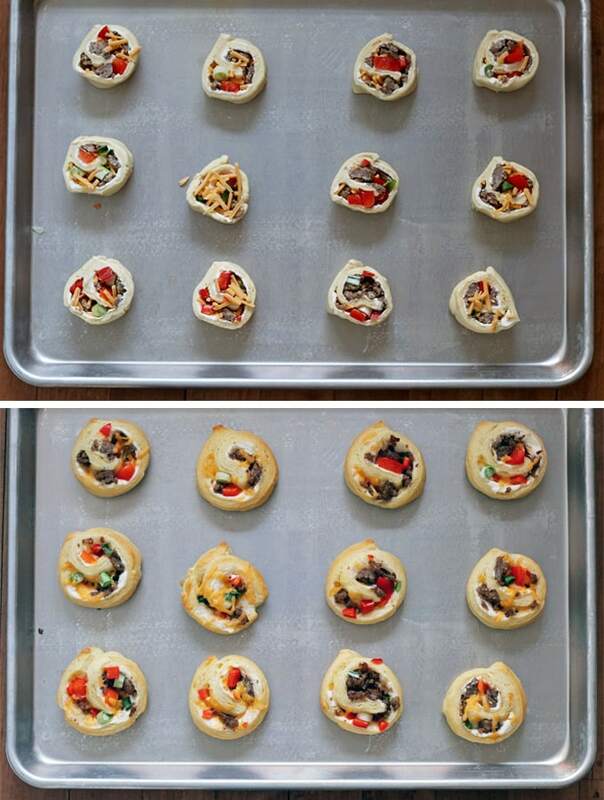 Then roll the dough to form a pinwheel by folding one end over the toppings and rolling – use both hands! Secure the pinwheel by pressing the dough without toppings into the outside of the roll. Then use a very sharp knife to slice 12 pinwheels out of each crescent roll dough. Pop the uncooked pinwheels on a baking sheet and then in the oven – before you know it you will have the perfect easy game day appetizer! If you are having a small group and think that 48 pinwheels are too many, this recipe can easily be reduced (or doubled!). Just cook enough of the sausage for as many pinwheels as you need (in quantities of 12) and save the remainder for breakfast the next day! I serve these pinwheels with a little ranch and usually make the entire 4 dozen batch. We rarely have leftovers of this easy and delicious appetizer!! 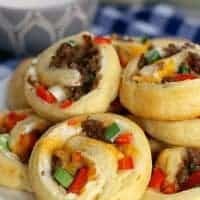 If you're looking for game day food, this sausage pinwheel appetizer is going to be your new favorite recipe for tailgating season. Just serve it with a little ranch! In a large, pan cook the sausage. Use a spoon to crumble and separate the sausage chunks. The sausage is done cooking when it reaches an internal temperature of 170'F. Remove from stove and allow to cool. Roll out one container of crescent roll dough on a cutting board, being careful to keep the perforations in tact. Use your fingers to pinch all of the perforations closed so that it becomes one big sheet of dough. Turn the dough so it is horizontal on the cutting board. Spread 2 ounces of cream cheese on the dough, leaving one inch at the top uncovered. Then sprinkle 3 ounces of cooked sausage, 1/8 cup bell pepper, 1/8 cup green onion and 1/8 cup cheddar cheese on top of the cream cheese. 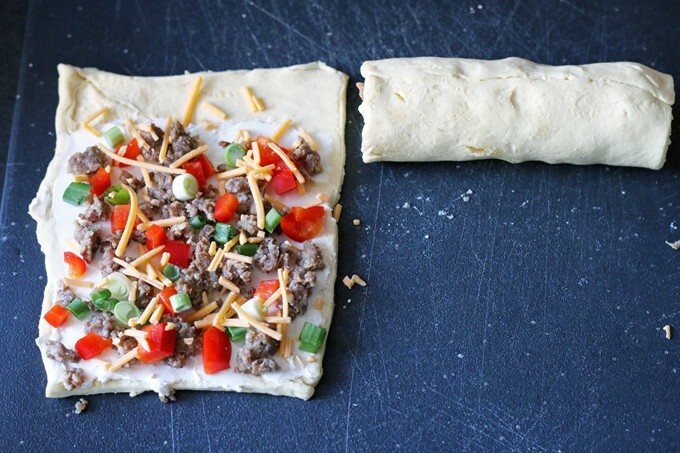 roll the dough to form a pinwheel by folding one end over the toppings and rolling – use both hands! Secure the pinwheel by pressing the dough without toppings into the outside of the roll. Then, use a very sharp knife to slice 12 pinwheels out of each crescent roll dough. Repeat with the other 3 crescent roll dough. Place the pinwheels on a cookie sheet and bake for 11-13 minutes or until the dough is crispy. Remove from oven and allow to cool for 10 minutes before serving. Jenny, I love pretty little appetizers, and sausage makes such tasty ones! I hope you all enjoy them Kimberly! What a fun idea! I love that you can just throw these in the oven and they are just a couple bites! I’m ready for this football snacks! My husband loves sausage so will be giving these a try! I personally am a huge fan of finger food season! And these definitely need to be included in my game day plans! 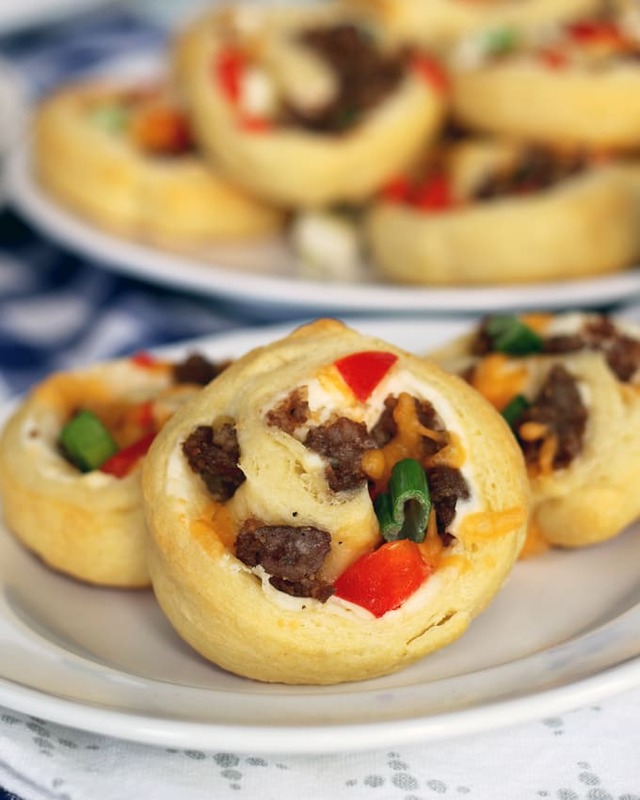 These little sausage stuffed pinwheels are perfect for Super Bowl! Perfect Super Bowl Game day treat! This sounds positively yummy! Thank you for sharing! These look awesome! Perfect finger food! 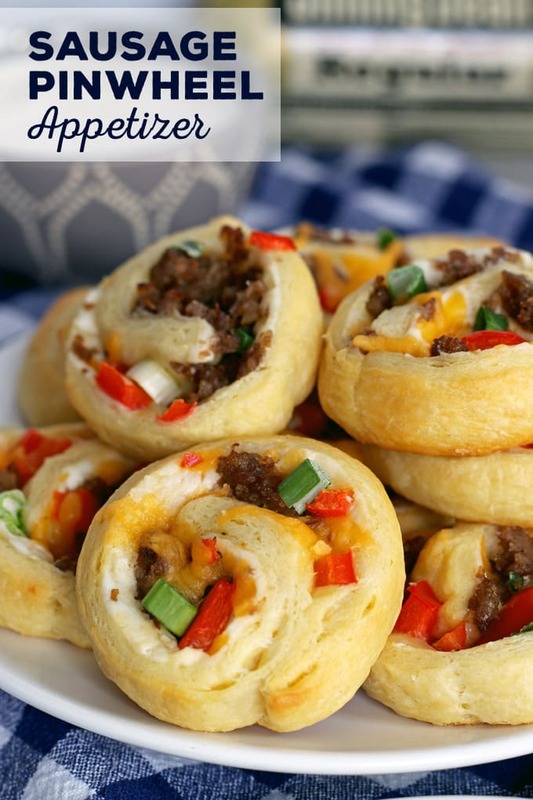 These would make a perfect snack or weekend lunch for hubby and the kids! They look so good! Food seems so much more festive when it is in a pinwheel, doesn’t it. Thanks for sharing on the Creative K Kids Linky Party this week. I hope you will join us again next week. Thanks for sharing this recipe at Craft Frenzy Friday on Mom Home Guide! These look so good! I might make these this Sunday for the Super Bowl!! Looks soo yummy and perfect for tailgating or hosting game day! Total yum! I love that this is a yummy affordable snack! These look so easy and delicious! Thanks for linking up with What’s Cookin’ Wednesday! These look amazing and very easy to do. I’ll pin for later! Thanks for sharing on our link up last week. These look so good, and I love the way you worked in some veggies!! Thanks for sharing this with us on Throwback Thursday! Hope to see you next week!